We will know in a few years if a new treatment will end up being a cure for AIDS. 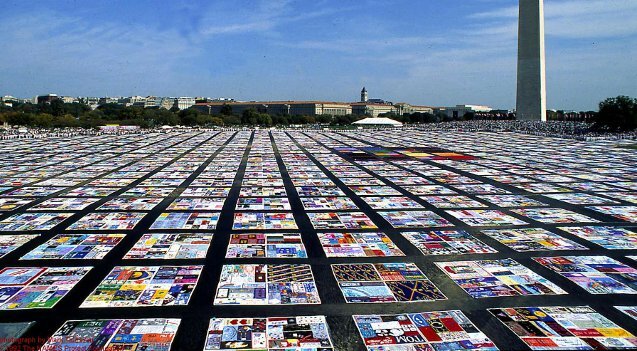 This image of the AIDS quilt is courtesy of Wikimedia Commons. Ever since AIDS emerged as a deadly disease in the early 1980’s, scientists have been looking for a cure. And now, using a very precise set of DNA scissors, they may finally be taking baby steps towards one. The new hope rests on the old observation that a few people are highly resistant or even immune to HIV, the virus that causes AIDS. These people can live a high-risk lifestyle that results in multiple exposures to the virus and still never end up with the disease. When scientists looked at these people’s DNA, they found that many of them shared a specific genetic mutation called CCR5 delta32. This mutation inactivates the CCR5 gene which means these people make no CCR5 protein. This lack of CCR5 protein makes these folks highly resistant to getting AIDS because the most virulent form of the virus, HIV-1, needs it to get into blood cells. No infection means no AIDS. While this is interesting and obviously a boon to the small minority of people with this mutation, it doesn’t seem like it would be very useful for people already infected with HIV. And yet it has turned out to be incredibly useful. Learning about this mutation pointed scientists towards a new class of drugs, CCR5 receptor antagonists. These drugs block the action of the CCR5 protein making it very difficult for HIV-1 to enter the patient’s blood cells. At least one of these, Selzentry, is currently being used to treat some cases of HIV. And this isn’t even the most exciting use of this discovery. Scientists in Germany actually used this knowledge to cure a man of his AIDS! The molecule in yellow, CCR5, may be the key to an eventual cure for AIDS. Image courtesy of Wikimedia Commons. Back in 2007, an AIDS patient in Berlin Germany was told he would need a bone marrow transplant to treat his newly diagnosed leukemia. He and his doctor decided to seek out a donor who had the CCR5 delta 32 mutation. The hope was that this bone marrow transplant would treat both of his diseases at once. Their hope was realized: his leukemia went into remission and his viral load became undetectable. This bone marrow transplant cured his AIDS. Bone marrow transplants replace a patient’s blood stem cells with the donor’s. What this means in this case is that the AIDS patient now had the donor’s blood cells coursing through his veins and these new blood cells lacked the CCR5 protein. Any HIV-1 he had in his system now had no way of making copies of itself which is why his viral load fell to the undetectable levels where they remain to this day. Unfortunately, scientists can’t do this for everyone with AIDS. Not only is the CCR5 delta 32 mutation rare enough that it would be impossible to find donor matches for all or even most AIDS patient, but bone marrow transplants are also dangerous, expensive treatments with a high mortality rate. No, we need a different way to use this mutation to help cure other AIDS patients. One way would be to engineer the mutation into a patient’s blood cells. Now we could avoid having to find a donor. This is just what the folks at Sangamo Biosciences are trying to do. With the help of a team of academic collaborators and money from California Stem Cell Bond, they have come up with a product called SB-728 that can specifically inactivate the CCR5 gene in human cells. This treatment has even made it into clinical trials where so far the results appear to be encouraging (although not everyone agrees). If this approach works, it would be a game changer for AIDS. The disease would go from being manageable to being functionally cured. And that isn’t all. There are other diseases that could be treated similarly. Success here could translate to a whole new way to get at other intractable diseases. This is all very exciting, but I want to caution against getting our hopes up just yet. This specific treatment could still fail in ongoing clinical trials or even turn out to not be a permanent cure. But still, because of the Berlin patient, we know that if we can inactivate the CCR5 gene in a patient’s blood cells, we can cure his or her AIDS. So even if this approach fails, there may be other ways to kill this gene. Image courtesy of Dr. Stacey Wirt, Stanford University. The science behind this approach is very cool. 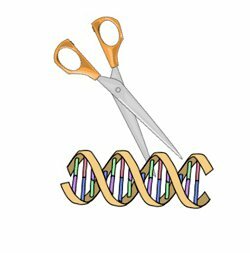 The basic idea is to create a pair of molecular scissors that will cut human DNA only at the CCR5 gene. Once cut, our cells will wreck the gene in the process of repairing the DNA. Remember, a broken CCR5 gene means no CCR5 protein which means no HIV-1 infection. The scissors part is easy. There are lots of enzymes whose job it is to cut DNA. The most famous are the restriction endonucleases from bacteria that serve as a part of their primitive immune system (they chop up invading viruses). In fact, molecular biology is built on these enzymes. At the time scientists at Sangamo started working on this approach, there were no natural enzymes specific enough for their purposes. The enzymes known at this time would cut human DNA at thousands of different places which would obviously be catastrophic. The patient would not survive such treatment. So the scientists needed to come up with a way to make these scissors only cut at the spot they wanted. There are a number of ways to do this but the scientists at Sangamo focused on natural DNA binders called zinc finger proteins. The first step was to figure out how these zinc finger proteins recognize specific DNA sequences. With a lot of work, they came to understand this well enough that they could now create zinc fingers that recognize any three bases they were interested in. So they could whip up one that recognized ATG and another that could recognize CCC and so on. So the scientists whipped up a protein that could specifically recognize the CCR5 gene and attached the unfortunately named Fok1 as its scissors. 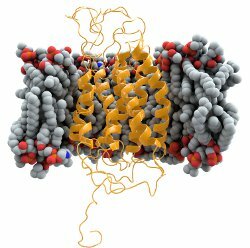 This protein cuts the CCR5 gene in cells in the lab and in clinical trials. So far so good. We need to wait to see what happens, but these trials are definitely something we need to keep our eyes on. They may not only lead to a functional cure for AIDS, but they could also open up a whole new way to treat diseases. A very nice explanation of zinc finger nucleases and a second type of scissors, TALENs.